China goes to space, China hosts the 2008 Olympics… and yesterday November 12: 91 Chinese scientists leave Shanghai for a new Antarctica expedition. 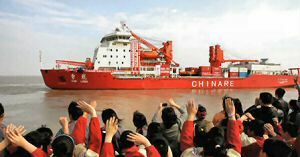 188 Chinese go on a 5 months Antarctica expedition: 91 Chinese scientists will reach Antarctica on the Xue Long Antarctica cruise ship, the rest of the 188 strong expedition will reach Antarctica by air. This will be China’s 24th scientific expedition to Antarctica. Temperatures on the ice sheet’s highest plateau on Antarctica drop to – 90 C and it has for long been considered "unapproachable". So this Chinese Antarctica expedition team will first conduct preparatory work such as boiling water and observing the atmosphere. China is making preparations to build a third Antarctica station and once the site is located, construction will start soon to be completed by 2010. 1 week ago, China sent 189 construction workers from the China Railway Construction Engineering Group to begin work on the biggest expansion of the two permanent Antarctic stations – Changcheng (Great Wall) and Zhongshan. 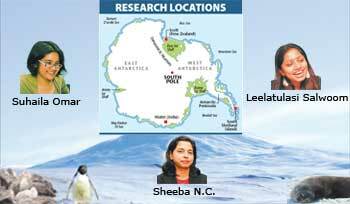 These workers will add facilities comprising a space observation station, garage, warehouse, garbage and sewage discharge system, boiler house, high-frequency radar room and oil tanker to the two Antarctic stations. To protect the environment, this South Pole construction group has built advanced sewage treatment systems and garbage burning facilities. Non-degradable and solid waste will be shipped back home for treatment. China launched its first expedition to Antarctica in 1984. 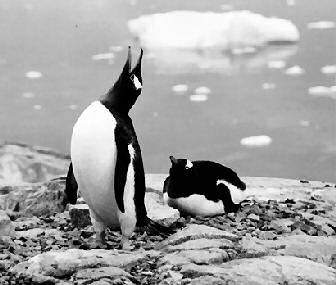 Since that first Antarctica "adventure", such expeditions have been conducted on an annual basis. China is part of the 82 stations built on Antarctica. Antarctica receives more than 30 scientific expedition teams every year, one of which is Chinese. How to get a free cruise to Antarctica? So if you ever wondered why politicians love to participate in an Antarctica tour: it’s merely because visiting Antarctica is the fastest way to burn any budget. Of course the budget of environment will be hurt the easiest, but even if you don’t have that, than use up the budget of science and technology: as maybe your country does need scientists on Antarctica as well? Or if you already have them, better go on an Antarctica expedition to find out what your scientists really are doing in Antarctica. 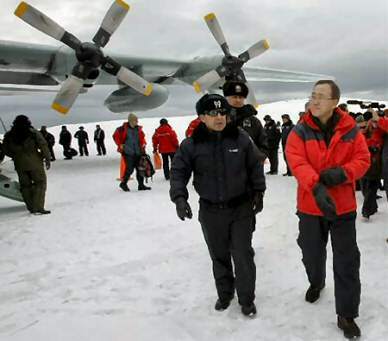 So United Nations Secretary-General Ban Ki-moon is viewing for himself the worrying effects of global warming by visiting Antarctica. Is Ban an expert and has he ever done an Antarctica expedition? Does he have any clue what to look at in Antarctica? Wouldn’t it be money well spend if real scientists gave Ban a report + documentary of how Antarctica was years before now compared to now? How can you see any effect of Global warming if you have no point of reference? You mean Ban can just go there and see the planet warming up the second he arrives? If that’s the case, our planet will be doomed to overheating in a matter of weeks! This must be really the coolest way of spending US money! Way to go Ban! Ban looking at global warming on his Antarctica cruise. like none, nothing, zero !!!! By the way: if you ever go on an Antarctica trip, then make sure you have your gloves on before you step outside the compartments of your Antarctica Cruise ship. 6 months after my Antarctica trip due to wet gloves, I could still feel the cold in my fingers! To add to the holiday experience, Ban will also visit the Torres del Paine National Park, home to Chile’s spectacular glaciers. Well that’s a no-brainer: they are also threatened by global warming, so that’s a good excuse to visit them! If there is one place that one should go before you leave this earth for good, Antarctica is one of them. It is an excellent place to go for an adventure cruise and a trip to this white continent will be a memorable one for anyone who has the golden opportunity to make a trip there. The best time to go for a cruise to the Antarctica is in the summer months for obvious reasons. However, summer is not “warm” and it can get very chilly and weather some times can be unpredictable. Also during the summers, the ice thaws so ships can navigate through the waters and ice. Do know when we talk about Antarctic summer, we actually refer to January and February, since we are talking about the South Pole (Australian readers won’t be surprised to hear this, as they also live on the southern hemisphere). When cruising in Antarctica , you can to see all kinds of wild life and different types of birds. You can see marine mammals like Humpback, Minke and Orca whales and seals as well. The wildlife and landscapes are truly unique and worth seeing. Quark Expeditions Cruises is one of the more established companies that organizes cruises on Russian icebreakers to the Antarctic continent. Their cruises focus mainly on giving you an adventure but do not expect too much luxury on board. It does roll around quite a bit so if you do not have sea legs, you are in for a ride! They do however have specialists on board that will provide you with the required information on polar ecosystems and even digital photography. … Well, on those days when the boat is not rolling and you are not sick to your stomach, eating is a joy at meal times. How to get a free Antarctic cruise? you need to be totally devoted to go on a polar research mission. 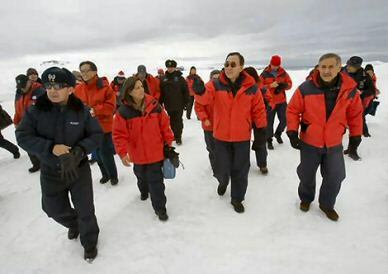 Each year, Malaysia sends an average of 14 scientists to the Arctic and Antarctic. The participants in these Antarctic expeditions are scientists and postgraduate students of which 70% are women. Most of them undertaking this Antarctica travel are young and very determined. So if you are crazy about Antarctica but never think of spending the money for going on an Antarctica vacation, why not divert your passion into becoming an scientist and even get paid to go on Antarctic expeditions? The 3 Malaysian polar researches (from the National Antarctic Research Centre) just came back from their first scientific Antarctica travel.